The Willow Springs Dinosaur Tracks are located in the Klonzo Mountain Biking Area north of Moab, Utah. The tracks can be found along the Willow Springs Road between the Houdini and Midway trailheads. Dinosaur tracks ranging from single or partial imprints to trackways of consecutive prints are not all that uncommon in the area. More tracks can be found in the immediate area at the end of the trail connecting the Midway and Carousel trails. There are also 3 popular trackways in the Klondike Bluffs Area known as Copper Ridge Dinosaur Trackway, the Dinosaur Stomping Ground and along the Klondike Bluffs Road. 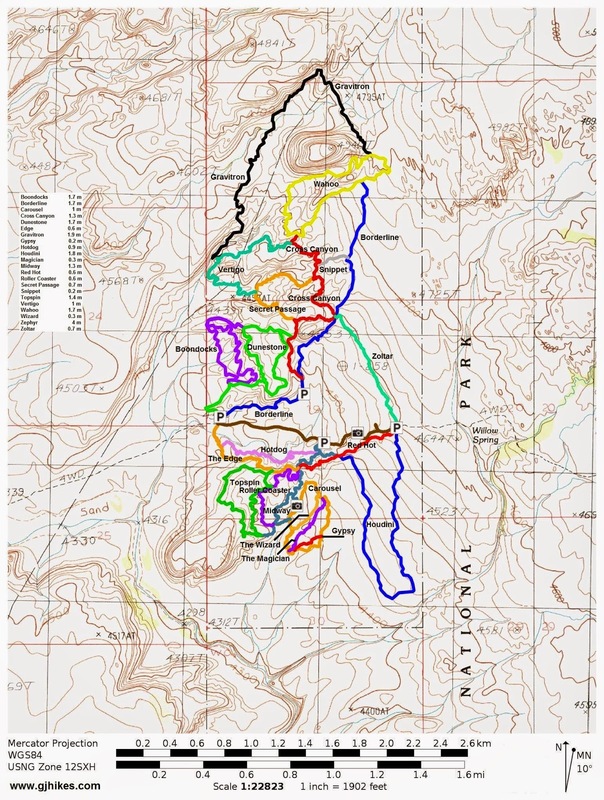 To get to the Klonzo area drive about 12 miles north of Moab, or 18 miles south from the Crescent Junction exit of Interstate 70, and turn east on the Willow Springs Road. Follow the dirt road for about 2.7 miles paying attention to the signs that direct traffic to the Klonzo area. The road passes through a big sandy wash that might require a 4-wheel drive at times. If you have to stop in the wash it is easy to get stuck in the loose sand. Passenger cars can find a place to park before the wash and begin from there. If your vehicle made it as far as Parking Area A then it can probably make it the rest of the way to the dinosaur tracks. Stay to the right after passing Parking Area A, cross the wash, and continue uphill. It should be about 3/4 of a mile from Parking Area A to the track site that is on the south side of the road. Enroute you will pass the Midway trailhead that looks like a big pullout along the Willow Springs Road and is marked with a sign. The track site is a long ribbon of sandstone that parallels the road and has been cleared of debris. Most of the tracks are wallowed out but there are several that still show up pretty well. The tracks were made by Therapod dinosaurs over 165 million years ago. A kiosk at the site provides a good bit of information that both children and adults should find interesting. A number of consecutive tracks form a trackway. 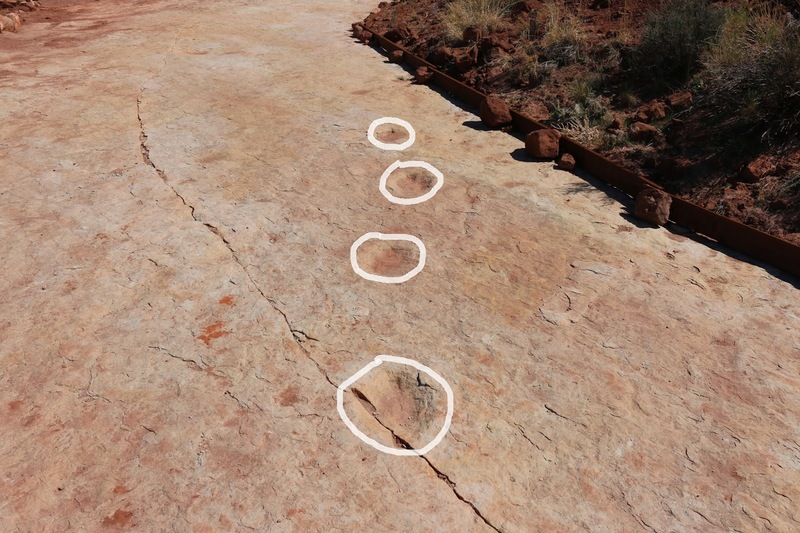 At the Navajo Dinosaur Track Site in Arizona there are examples of baby dinosaur tracks following next to their mothers. How cool is that? This picture is of the Willow Springs Road near the track site. Something like a pavement grinder was used to knock the tops off of the slickrock to make the road easier for most vehicles. We did see a passenger car in this area but it must have been a heck of a ride through the sandy wash to make it this far. For those people that happen to be in the area and like checking out dinosaur tracks be sure to take the time to see these. The more examples of tracks that you can study the better chances you will have of spotting tracks in other places that aren't marked with a sign. If you would like to see it for yourself then all you have to do is 'Take a hike'.